Description:This Divyadesam is located in the town of Sirkazhi known for its Shivastalam - a vast temple complex enshrining Bhramapureeswarar, Toniappar and Sattainathar. Sirkazhi is also the birthplace of the Saivite saint Tirugnanasambandar. Kaazhicheeraamavinnagaram is also known as Pataleekavanam, Uttamakshetram. 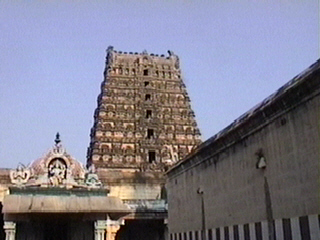 The temple: This east facing temple has two prakarams and a 3 tiered rajagopuram. There are slso shrines to Ganesha, Andal, Rama, Krishna and the Alwars. Legends: Legend has it that Vishnu blessed Romesa muni with a vision of Trivikrama with his left foot raised in the gesture of dominating the three worlds. Deities: The Moolavar here is Trivikraman - in the gesture of dominating the three worlds - facing east; Taayaar here is Lokanayaki. The Utsavars are Trivikrama Narayanan and Mattavizhkuzhali. The other Divya Desams enshrining Trivikrama are Tiru Oorakam (Kanchipuram) , Tirukkovilur and Tiruneermalai. The image above is that of the grand Ulagalanda Perumaal temple complex at Tirukkovilur.